Architect Michael Arad and landscape architect Peter Walker created the Memorial design selected from a global design competition that included more than 5,200 entries from 63 nations. The Memorial’s twin reflecting pools, each nearly an acre in size and featuring the largest manmade waterfalls in North America, are set within the footprints where the Twin Towers once stood. The names of every person who died in the 2001 and 1993 attacks are inscribed into bronze panels edging the Memorial pools, a powerful reminder of the largest loss of life resulting from a foreign attack on American soil and the greatest single loss of rescue personnel in American history. The museum itself is located below the reflecting pools and features first-person accounts of what happened on that September morning in 2001 and multi-media displays examining the background of the attacks, the story of what happened on 9/11 and the aftermath and continuing implications of the attacks. Enter the dramatic Foundation Hall, containing the "slurry wall", a surviving retaining wall of the original World Trade Center, as well as the 36-foot-high "Last Column", covered with mementos, memorial inscriptions and missing posters and see the historic "Survivor's Stairs", a remnant of the staircase through which hundreds escaped with their lives. The memorial exhibition called In Memoriam, honours those that lost their lives that day in 2001 as well as the people who were killed during the World Trade Center 1993 bombing. Learn about some the individual victims and their stories and see portraits of the nearly 3,000 men, women, and children who were killed in the attacks in the memorial exhibition. 180 Greenwich St, New York. The 9/11 Memorial Museum is open from 9.00am until last entry (4.30pm on Tuesdays, 6.00pm Sundays, Mondays, Wednesdays and Thursdays and 7.00pm on Fridays and Saturdays). Upon arrival, skip the main ticket line and proceed straight to the Admission Desk. If there is availability to enter the Museum at the time of arrival, you will be able to proceed straight away. If that timeslot is full, you be placed on the next timeslot, giving you time to explore the Memorial’s twin reflecting pools before entering the musuem. No need to pre-book a time slot - simply show up when you want! Skip the ticket line and proceed straight to the Admission Desk for check-in where upon you'll be given the next available slot. 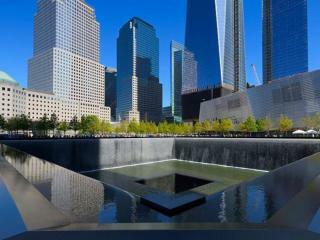 There may be a short wait during which you can explore the Memorial’s twin reflecting pools. Tickets are open-dated and valid to use at any time within a year of purchase; you are not restricted to the date selected at the time of booking. Do I need to book a date and time for my visit to the 9/11 Memorial Museum? No, our fully flexible tickets are the only ones that do not require you to book a time slot in advance. Visit on a date and time that best suits you - on arrival proceed straight to the admission line. If there is availability to enter the Museum, you will be able to enter straight away. If that time slot is full, you be placed on the next time slot, giving you time to explore the Memorial’s twin reflecting pools before entering the museum.